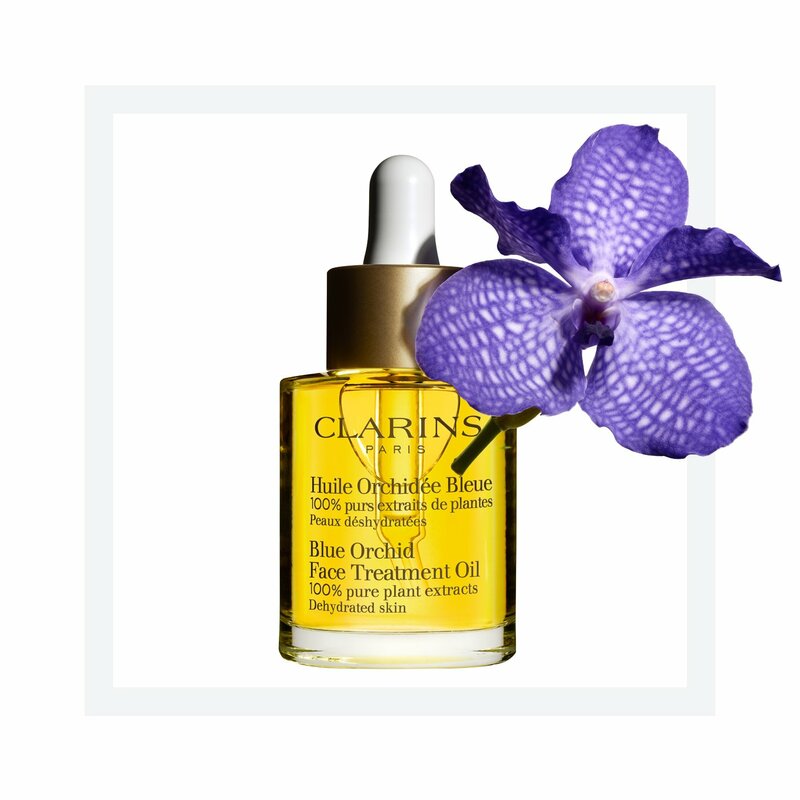 The Clarins Blue Orchid Face Treatment Oil is a targeted treatment for dehydrated skin that tones, revitalises and restores radiance to moisture-depleted skin. Utilising the principles of aromatherapy and phytotherapy, the moisture care face oil combines plant extracts and essential oils to help balance the skin. Made from 100% pure plant extracts, this best-selling face oil contains extracts of Rosewood, Patchouli and Blue Orchid. Added Hazelnut Oil helps prevent moisture loss and the formation of fine lines. The rebalancing moisturiser for dry skin nourishes and revitalises dehydrated skin, and leaves it feeling satin soft. Rated 5 out of 5 by GiselaD from A life savior for areas in need of extra care! I used it for the first time when I was a teen and I remember how good my skin used to feel afterwards. My mum and I, we both have a combination skin but with dermatitis, so we need a product that does not worsen our combination skin but that hydrates our eczema. A very small amount goes a long way. This product is a total savior if you have areas that need extra care (also it smells amazing). Although it is an oil, your skin does not feel oily or shinny after using it. Rated 5 out of 5 by Susannah1 from A lifetime with Clarins Orchid Oil Being acutely atopic has meant that Clarins was always my first choice for skin care products, and they have never disappointed. I use Orchid Oil all over my face and décolleté, it sinks into my skin without any negative reaction and being well hydrated helps with my oversensitivity. It also smells good, and being less wrinkled is a marvellous bonus. Rated 5 out of 5 by Starla from Ĺove love love I bought this after having a Clarins facial as this is what the therapist used.OMG!! it is lovely, smells wonderful and easy to use. Leaves my skin feeling relaxed and hydrated. I use it at night on my face, neck and decollatage. Face is more plumped and radiant using.Chin and neck are more toned and decollatage area isnt an issue yet but im hoping this will help prevent/slow anti aging in this area. I'll be buying this forever. Rated 5 out of 5 by Rebecca21H from Combination/ Dry Skin I first tried this oil as a tester when I purchased some other clarins products. I am 21 and have very sensitive skin and have found that clarins as a brand is excellent for my skin type. This oil used at night combats my stubborn dry skin without making me extra oily in my other not so dry areas. The aroma from this oil is so relaxing and I do believe it helps calm me, leading to a great night's sleep. Can't rate this product enough, however I would advise applying this to the skin about 30 minutes before bed to allow time for the oil to fully absorb. Rated 5 out of 5 by Trish from Addictive Aroma I love love love this product. First introduced as a sample, I now can't live without this product. I use it every day. The smell of it is absolutely lovely. I can't get enough of it. I use this straight after washing my face and massage it in and love how soft it leaves my skin. I was worried it may make it greasy, but it absorbs really quickly just leaving soft, deliveries smelling skin, Yum! I've told all my friends and have added it in big letters to my Christmas list too. Thanks goodness their body oil smells as good!